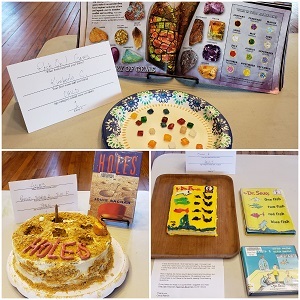 Thanks to everyone who voted in the Edible Books Contest, and especially huge thanks to all of the participants who created literary art with food! The votes have been counted...see below for the results! In the Children’s Category, the winner is Kimberly for “Rock On! Gems.” Kimberly received 38 votes. In the Teen Category, the winner is the team of Robyn, Sigrid, and Tilly for “Holes.” They received 37 votes. In the Adult Category, the winner is Oona for “One Fish, Two Fish, Red Fish, Blue Fish.” Oona received 42 votes. Great job, everyone!!!! We look forward to seeing some awesome entries for the next Edible Books Contest which will take place during the summer reading program – stay tuned for details!